Free Shipping on Orders Over $99 at Clarks Shop a wide range of shoes and save on delivery with this amazing offer. Sale from $15 at Clarks Discover a wide range of men's, women's, and kids' shoes on sale. When you need a pair of shoes, you go to Clarks. This is a brand that’s synonymous with quality and style that lasts, just like a shoe should, and that’s why you can rely on this footwear specialist to kit out the whole family. The Clarks difference is certainly in the comfort, achieved by incorporating the latest footwear technologies into the very sole of every pair of shoes. Crafted with precision, think moisture-wicking insoles, soft leather outers all while remaining feather light and stylish of course, Clarks shoes really tick all the boxes. While comfort is key, style is too and you’ll find nothing less than impeccable designs that are on trend every season. Shop the ‘New In’ section to see what’s just adorning the current collections and men, women, girls, boys can all enjoy a diverse range of fresh footwear. From classic shoes like brogues and desert boots to sandals, quirky trainers and heels too, you’ll find new takes on the shoes you love. At Clarks you can stay safe in the knowledge that you’ll find smart shoes for all occasions; for the office, the beach, and you can visit the School Zone to find those all important shoes for little ones too. Created to keep them comfortable while they stay on their toes and play around all day long, you can trust that Clarks has everyone’s footwear needs covered. How do I use my Clarks promo code? Click on an offer of your choice and copy the promo code if needed before heading to clarks.com/au. Choose your Clarks items, the size and quantity you need then add them to your cart. Click ‘view cart’ when you’re ready and ‘pay now’ to go to your bag. Enter your promo code in the space and use the ‘Apply Code’ button to update your cart total. Continue to checkout from Clarks with your savings. Become a loyal Clarks’ member and you’ll be in for a world of surprises! When is the Clarks' sale? There is a Clarks' sale page to browse online for an extra bargain! What size should I order in Clarks shoes? You can find both a Clarks kids and adults size guide to reference online from the homepage. Where is my nearest Clarks store? You can use the Clarks’ store locator online to find one near you. Standard Shipping is free on orders above $99 and orders below will be charged $9.95. Express Shipping is also available for $14.95. Delivery times vary. 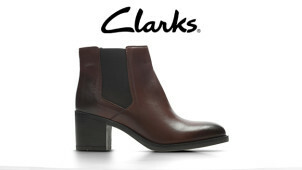 Clarks offers FREE returns within 28 days of the order date for items costing more than $60. Items must be unworn, in the original box and with all the tags attached. Exchanges are not available for online orders. Send Clarks a message online. Clarks is household name in footwear, a global brand, which specialises in turning catwalk looks into wearable shoe styles for the whole family to enjoy. A Clarks promo code is sure to put a spring in your step, when you can shop fashionable shoes for men, women and kids alike. Alongside funky school shoes, shop trendy desert boots, stylish sandals and a whole host of seasonal footwear. Whatever your style may be, you’re sure to find yours in the quality shoe selection available from Clarks. The Clarks’ blog is where you need to go for all the latest footwear trends. From cool school shoes to the new season collections, this is where to get your style know-how. Renowned for innovative shoe features that make Clarks shoes oh so comfortable and easy to wear, the blog will keep you updated on new additions technologies, colours and more to adorn the impressive collections. Clarks is renowned for its desert boots. Perfect in all seasons, come summer come winter, there’s nothing that a sturdy pair of desert boots can’t handle. Always on trend, the desert boot is somewhat iconic, so why not grab your favourite pair using a Clarks coupon? You’ll save on clean lines and a roughed up finish to make for an effortlessly cool look. Available for men and women in classic black suede, rust and more colours which will change with the seasons, a wardrobe essential, why wouldn’t you invest?